Baghdad- The U.S. army said on Saturday a service member died in a non-combat related incident in Baghdad. Baghdad- A car bomb on Saturday left three civilians dead and seven wounded in the Shiite Sadr city in eastern Baghdad, a police source said. NEAR BAGHDAD - The U.S. military captured 16 suspected insurgents in the last 48 hours just south of Baghdad, the military said. BAGHDAD - A car bomb killed five people and wounded 22 outside the Sadrayn hospital in the Shi'ite district of Sadr City in Baghdad, police said. Baghdad - Three policemen injured by roadside bomb explosion. The bomb was targeting their patrol in Hey Al Amil neighborhood south west Baghdad. Baghdad - US vehicle was disabled by an IED explosion that targeted an American convoy in Al Bonok neighborhood east Baghdad. Baghdad - American forces killed a mother and her child while they were walking in Al Saidiyah neighborhood south Baghdad. Baghdad - IED exploded in Sleikh neighborhood north east Baghdad. No casualties recorded. Baghdad - A mortar shell fell in Adhemiyah neighborhood east Baghdad without causing any casualties. Baghdad - An insurgent threw a grenade in a park in Al Zafaraniyah neighborhood south east Baghdad where children play soccer, injuring two of them. Baghdad - 10 bodies were found in Baghdad today. 8 bodies were found in Karkh, the western part of Baghdad in the following neighborhoods (3 bodies in Doura, 2 bodies in Hay Al Amel, 2 bodies in Mamoun, 1 body in Hurriya.) 2 bodies were found in Risafa, the eastern part, one body in Amin neighborhood and another body in Fudheliyah neighborhood. TAL AFAR - Four Sunnis were killed in the northern town of Tal Afar on Friday, police said. TAL AFAR - Tuesday's suicide truck bombing in the northern town of Tal Afar left 152 people dead and 347 wounded according to a final tally revealed by Iraq's Interior Ministry. The bomb, which targeted a Shi'ite neighbourhood of the religiously mixed town, destroyed 100 homes. Forty-seven Sunnis were killed in reprisals after the attack. KIRKUK - Gunmen ambushed a vehicle carrying civilian workers employed at an Iraqi military base near Hawija, 70 km (43 miles) southwest of Kirkuk, killing eight and wounding two, police said. Four brothers were among the dead. Kirkuk- An explosive charge detonated on Saturday near a police vehicle patrol in the northern Iraqi city of Kirkuk, killing a policeman and wounding two civilians, a police source said. MAHMUDIYA - Three mortar bombs hit a residential area in Mahmudiya, 30 km (20 miles) south of Baghdad, killing two people and wounding four, police said. HILLA - A car bomb killed four people and wounded 23 in the Shi'ite city of Hilla, 100 km (62 miles) south of Baghdad, police said. TUZ KHURMATO - A suicide car bomb targeting Shi'ite day labourers killed two people and wounded 11 in the town of Tuz Khurmato, 70 km (43 miles) south of Kirkuk, police said. SUWARYA - Five bodies were found blindfolded and handcuffed on Friday in the Tigris River near Suwayra, south of Baghdad, police said. MOSUL - A parked car bomb targeting a police patrol wounded six people in the northern city of Mosul, 390 km (242 miles) north of Baghdad, police said. KANAAN - The Iraqi army raided the town of Kanaan, near Baquba, and arrested 110 suspects, an Interior Ministry source said. Diyala Province - Medical source said “we received 4 dead bodies and 2 injured” from Al Botoama village in Al Salam area. the victims were shot last night during clashes with gunmen near their village. Diyala Province - Insurgents from Al Bazool village attacked Al Anbakia and Al Bo Toama villages last night. The clashes killed 2 and injured 2 from defenders. An American helicopter raided another group that was supporting the attackers and killed 2 of them. Baqouba - A security source said that three civilians were killed by insurgents in Al Mu’alimeed neighborhood. Baqouba - Two insurgents were killed in clashes with the security forces in Door Al Majoon neighborhood. Muqdadiya – A civilian was killed in Muqdadiya town east north Baqouba. DIWANIYA - A police officer was shot dead on Friday in front of his home in Diwaniya, 180 km (112 miles) south of Baghdad, police said. Dalouiyah- An explosive charge detonated on Saturday near a police patrol in Dalouiyah, 90 km north of Baghdad, killing a policeman and wounding another, a police source said. Diwaniyah- Unknown gunmen on Saturday killed a contractor along with his nephew and wounded his brother in Diwaniyah city, 180 km south of Baghdad, a police source said. Dalouiyah- U.S. forces on Saturday detained four persons in a search campaign at a fuel station in Dalouiyah, 90 km north of Baghdad, a police source said. Falluja- Mortar rounds were fired Saturday onto a U.S. base in Saqlawiyah, 15 km northwest of Falluja, local residents said. Falluja- Unknown gunmen on Saturday shot and killed a senior officer from the former Iraqi army in Falluja, 45 km west of Baghdad, a police source said. Basra- British forces arrested in the early hours of Saturday three suspected gunmen in a search campaign in central Basra, while a British base came under attack with no damage reported in the southern Iraqi city, the spokeswoman for the British forces in southern Iraq said. 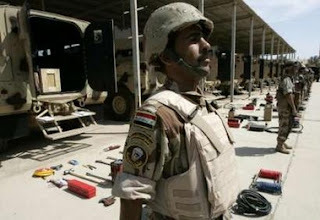 Sawirah- An explosive charge went off on Saturday in a bus station in Sawirah, southeast of Baghdad, killing a civilian and wounding four others, a local police source said. The Iraqi government raised the death toll on Saturday from a truck bomb in the town of Tal Afar to 152, making it the deadliest single bombing of the four-year-old war. Interior Ministry spokesman Brigadier Abdul Kareem Khalaf said 347 people were wounded in Tuesday's attack on a Shi'ite area. There was another truck bomb in the mixed northwestern town on Tuesday, but it was small. Khalaf said 100 homes had been destroyed in the main blast, which officials have blamed on al Qaeda. The explosion left a 23-meter (75-ft)-wide crater. "It took us a while to recover all the bodies from underneath the rubble of the homes ... what did they achieve by using two tons of explosive to kill and wound 500 in a residential area?" Khalaf asked at a news conference. Iraqi Justice Minister Hashem al-Shebly has resigned because of dissatisfaction over the running of the government, an official said on Saturday. Izzat Shahbandar, a spokesman of the secular Iraqi National List to which Shebly belongs, said the resignation had been accepted by Shi'ite Prime Minister Nuri al-Maliki. "He did not feel there was any harmony in government policy and he did not want to continue," Shahbandar told Reuters. Shahbandar said Shebly had offered his resignation three days ago. The Iraqi National List is headed by former interim prime minister Iyad Allawi. Iraqi amateur singer Shazha Hassoun's win in the popular contest Star Academy, televised by Lebanese channel LBC, was the cause of celebration all over Iraq, causing Iraqis to forget for a while about the waves of violence hitting the troubled country. "I was pinned to the TV screen yesterday praying for Shazha to win. I would have had a heart attack if she hadn't. I recommended all my relatives and work colleagues to vote for her," Um Solin, an employee, told the independent news agency Voices of Iraq (VOI) on Saturday. Fadi, a student, said he spent 40 dollars (50,929 Iraqi dinars) buying two cell phone pre-paid cards to vote for her. Omar Abdul-Mohsen, a contractor, said "Shazha is our sister who has brought joy to our hearts. All members of my family kept praying for her, even my aging father." Many view Shazha's win as success for Iraq. Some even went further to consider it a ray of hope for Iraq's unity. Hard-pressed staff daily confronts the horrors of local bloodletting. After twenty years of service at the Mosul morgue, Abdul-Kareem Ahmed has become inured to death. All the more so over the last few years of violence, which has claimed the lives of up to 150 of the city’s residents a day. But Ahmed’s detachment was shattered when the charred body of a young man was laid out on the autopsy table. Ahmed immediately recognised the silver ring on the corpse’s finger - a gift he had given his 20-year-old son Kazim when he graduated from the College of Administration at Mosul University. Ahmed stared at the body in disbelief - his son, he said, was no more than “some bones and burned flesh" - and then broke down and cried. As with the central morgue in Baghdad, Mosul’s morgue struggles to cope with the number of corpses that are brought in each day. Like the capital, this northern city - a stronghold of Sunni militants, foreign fighters and members of the Islamic Emirate in Iraq, which allies itself with al-Qaeda - has been ravaged by the insurgency and sectarian conflict. Khalid Abdul-Ameer, an administrator at the morgue, said sometimes they receive corpses of entire families that were killed because of their religion, ethnicity or the party affiliation or profession of one or more of its members. The constant stream of charred, deformed and mutilated corpses, and the public’s apparent disdain for the job they do, puts the 23 staff under the enormous psychological strain. “People look at us as if we were butchers,” said one employee. Their one consolation, it seems, is that unlike in Baghdad, militants have yet to target them. Farm-girl defies the odds to front popular Baghdad radio show. In her jeans and sneakers, Majide al-Jiburi, 43, sitting in her studio on the second floor of Radio al-Nas (People) in Baghdad, looks every bit the urban professional woman. But the moment she begins to speak, her accent betrays her rural Iraqi origin. “I never dreamt I’d end up in the city, and I am still afraid of my family and my community,” said the farm girl-turned-radio anchor. She began her radio career as a presenter on Radio Mahabba (Love), hosting a programme that dealt with the lives of women in the countryside. Her current show is a popular 45-minute morning phone-in, a mixture of news and history, cultural and educational topics. Majide’s rise from farmer’s daughter to host a top radio show in the capital is a rare exception in Iraq, where women from rural areas face many restrictions in terms of education and social mobility. Tribal traditions often keep them from studying, working outside the house, going out with friends, and can mean that they have little choice when it comes finding a husband. Born in a village near Hilla, the largest town in Babil province, southeast of Baghdad, Majide had a difficult life before she got married and moved to Baghdad in 2004. She completed primary and secondary school but had to drop out of further education for financial reasons. There were other problems too. Her family got into trouble with the former regime because of their communist beliefs - outlawed in Saddam’s time. She and one of her brothers were arrested repeatedly. Compared to her former life, she’s now very happy and considers herself rather privileged. In the past, she had to work to the point of physical exhaustion just to bring enough food to the table, but now she feels she’s treated with respect and dignity. Muqtada al-Sadr released a statement Friday, read at Friday prayers in Najaf. IraqSlogger has obtained the document; full text appears below. Translators remarks appear in parentheses. Four years have passed since the occupation of our beloved country on the part of the great evil, America, and its followers who have assigned to themselves the elimination of Islam and of peace from the world, in order that they may live in peace. And the words of the great evil, Bush, continue to ring in the ears of the oppressed when he says “America has become more secure,” unaware of the blood that was shed in Iraq, and Afghanistan, and Palestine, and Lebanon, and many other places. Yet, how I wish peace for the people of peace! As the Most High has said (in the Qur'an), “Grant the unbelievers a short respite.” Four years have passed and Iraq is still languishing under the yoke of oppression and tyranny. So where are their claims of spreading freedom, from the prison of Abu Ghraib and the rest of the Iraqi prisons, as the prisons are still full of women and men? Is this (imprisonment) due to the misdeeds (of the prisoners)? Is this due to courts that are just? Bombs and explosions continue to resound in the skies and land of Iraq, shedding the blood of the innocent and the honorable, yet leaving the occupier and its partisans in our holy land. Yet how I wish that these humiliations be a call for resistance! Iraq’s government has endorsed plans to relocate thousands of Arabs who were moved to Kirkuk as part of Saddam Hussein’s campaign to force ethnic Kurds out of the oil-rich city, in an effort to undo one of the former dictator’s most enduring and hated policies. The contentious decision on Kirkuk was confirmed Saturday by Iraq's Sunni justice minister as he told The Associated Press he was resigning. 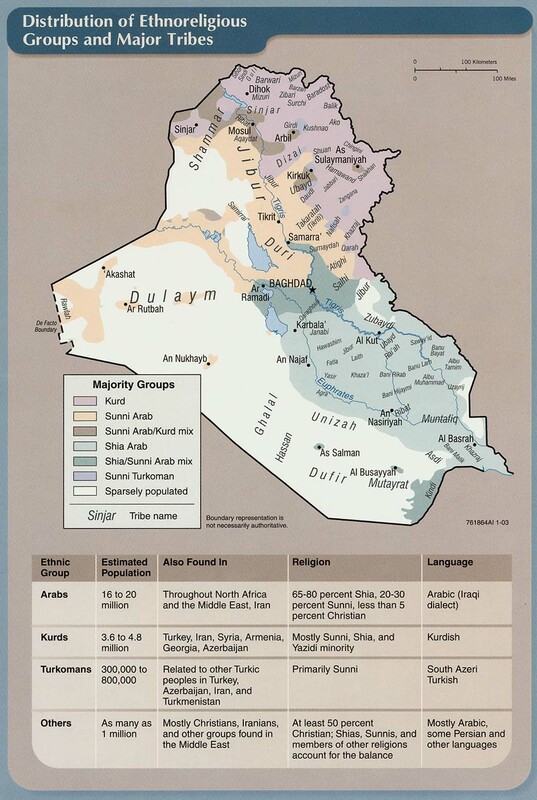 Almost immediately, opposition politicians said they feared it would harden the violent divisions among Iraq's fractious ethnic and religious groups and possibly lead to an Iraq divided among Kurds, Sunni Arabs and Shiites. The plan was virtually certain to anger neighboring Turkey, which fears a northward migration of Iraqi Kurds — and an exodus of Sunni Arabs — will inflame its own restive Kurdish minority. Tony Lagouranis is a 37-year-old bouncer at a bar in Chicago's Humboldt Park. He is also a former torturer. That was how he was described in an email promoting a panel discussion, "24: Torture Televised," hosted by the NYU School of Law's Center on Law and Security in New York on March 21. And he doesn't shy away from the description. As a specialist in a military intelligence battalion, Lagouranis interrogated prisoners at Abu Ghraib, Al Asad Airfield, and other places in Iraq from January through December 2004. Coercive techniques, including the use of military dogs, waterboarding, and prolonged stress positions, were employed on the detainees, he says. Prisoners held at Al Asad Airfield, which is located approximately 110 miles northwest of Baghdad, were shackled and hung from an upright bed frame "welded to the wall" in a room in an airplane hanger, he told me in a phone interview after the NYU event. When he was having problems getting information from a detainee, he recalls, the other interrogators said, "Chain him up on the bed frame and then he'll talk to you." (Lagouranis says he didn't participate directly in hangings from the frames.) The results of the hangings, shacklings, and prolonged stress positions -- sometimes for hours -- were devastating. "You take a healthy guy and you turn him into a cripple -- at least for a period of time," Lagouranis tells me. "I don't care what Alberto Gonzales says. That's torture." US forces raided the residence of an Iraqi member of parliament, one day after he called for the relocation of the US embassy. 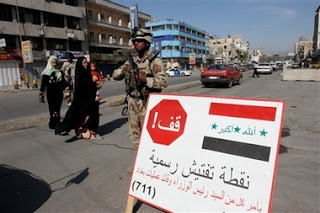 The Iraqiya network has reported that the a US force raided the residence of Mithal al-Alousi, member of parliament and general secretary of the Iraqi 'Umma party, inside the Green Zone in the center of Baghdad, Aswat al-Iraq reports in Arabic. Further details on the raid were not available. One day before, the MP had demanded that the US embassy should be relocated from its current site at the Republican Palace inside the Green Zone, saying that the foreign presence in the building was a provocation to the feelings of Iraqis. Though Saddam Hussein has been dispatched, the trial of his confederates continues in Baghdad. In the next few months, the Special Iraqi Tribunal will be hearing evidence against almost a hundred of Saddam's former officials, charged with the slaughter of tens of thousands of Shiites following the abortive uprising or Intifada of 1991. Because of the way the Tribunal has been run, it's highly unlikely there'll be any mention of U.S. complicity with that slaughter. In fact, President George H. W. Bush was very much involved. It was he who in February 1991, as American forces were driving Saddam's troops out of Kuwait, called for the people of Iraq to rise up and overthrow the dictator. That message was repeatedly broadcast across Iraq. It was also contained in millions of leaflets dropped by the U.S. Air Force. Eager to end decades of repression, the Shiites arose. Their revolt spread like wildfire; in the north, the Kurds also rose up. Key Iraqi army units joined in. It looked as if Saddam's days were over. But then George H. W. Bush blew the whistle. Things had got out of hand. What Bush had wanted was not a messy popular uprising but a neat military coup -- another strongman more amenable to Western interests. The White House feared that turmoil would give the Iranians increased influence, upset the Turks, wreak havoc throughout the region. But the Bush administration didn't just turn its back; it actually aided Saddam to suppress the Intifada. ….. A Shiite survivor of the uprising later said he had seen other American forces at the river town of Nassiriya destroy a huge cache of weapons that the rebels desperately needed. "They blew up an enormous stock of arms," he said. "If we had been able to get hold of them, the course of history would have been changed in favor of the uprising, because Saddam had nothing left at that moment." 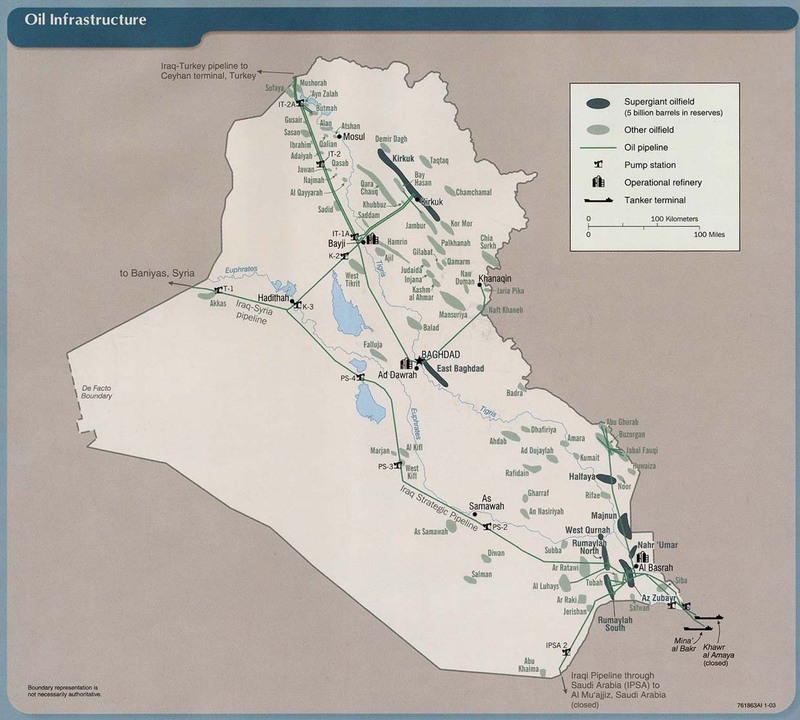 To ensure that the money reaches the Iraqi program, write "Iraq-icmc" on your check. The average numbers of people killed and of car bombs have increased slightly, according to statistics that McClatchy Newspapers compiled. While conducting a combat security patrol, a MND-B Soldier died and another was wounded when an improvised explosive device detonated near the Soldiers in a southern section of the Iraqi capital March 29. Iraqi state television said Friday that U.S. air strike killed 16 people in Sadr City, a Shiite stronghold in eastern Baghdad, while the U.S. military said they raided the Shiite bastion and detained a suspected militant. Al-Iraqia, the Iraqi state-run television, reported the incident, adding 14 more people were wounded in the attack. The U.S. military did not confirmed the incident. More than 20 people were killed and wounded when U.S. troops pounded a village east of Baghdad early on Friday, a well-informed police source said. "U.S. troops, including aircraft, pounded the village of Sha'ourah Wa Jider in an area between Baghdad and Diyala province, killing and wounding more than 20 people," the source told Xinhua on condition of anonymity. There was no further information available about the incident,the source said. The U.S. military did not confirmed the incident. A U.S. force raided on Friday an office of Shiite leader Muqtada al-Sadr in al-Hurriya district, north Baghdad, killing a loyalist and a child and arresting two others, eyewitnesses said. "The U.S. force opened fire and hurled tear gas canisters inside and around the office," the witness, a local resident of al-Hurriya, told the independent news agency Voices of Iraq (VOI). The child was killed while passing by near the scene of the raid, the witness added, noting U.S. troops are still taking positions around the office. Iraqi and U.S. forces captured a man believed to be involved in bringing explosively formed penetrators (EFPs) into Iraq, the U.S. military said. The EFPs are a particularly lethal form of roadside bomb. 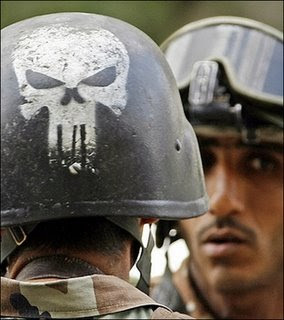 Eleven gunmen were arrested on Friday in raids carried out in west Iraq, the Multi-National Force (MNF) said. Gunmen killed two policemen in a drive-by shooting and wounded another in a village near the city of Hilla, police said. 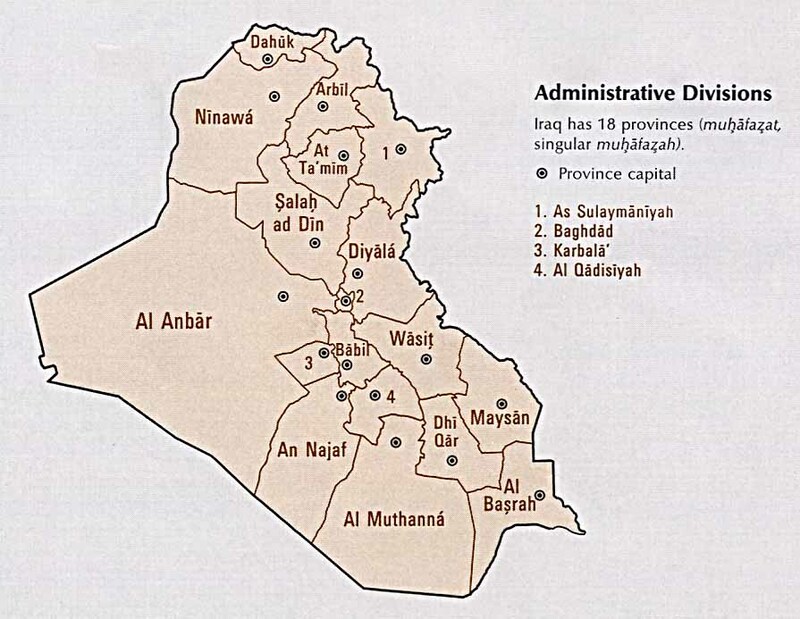 Hilla is 100 km (62 miles) south of Baghdad. 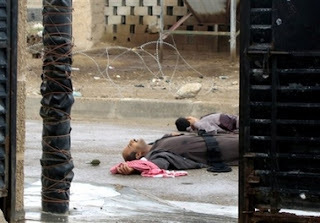 Gunmen shot dead a man in front of his shop in Diwaniya, 180 km (112 miles) south of Baghdad, on Thursday, police said. Police said they found 25 bodies in the northern city of Mosul on Thursday. Police said they believed the high number of killings was triggered by tensions linked to sectarian violence in nearby Tal Afar, where 155 people were killed this week in attacks. Two explosive charges went off near U.S. and Iraqi vehicle patrols in two separate incidents in the northern Iraqi city of Mosul with no reports of casualties, a security source said on Friday. An Iraqi police patrol on Friday detonated a car bomb left by unidentified people in eastern Mosul, Iraqi police sources said on Friday. Radio Sawa's correspondent in Basra city Majid al-Brikan survived on Friday an attempt on his life when three gunmen opened fire against him outside his house in central Basra, 550 km south of Baghdad, an eyewitness said. A U.S. vehicle was destroyed on Friday when a car bomb was detonated near a U.S. vehicle patrol in Falluja, 45 km west of Baghdad, an eyewitness said. A U.S. vehicle was destroyed on Friday when an explosive device detonated near a U.S. vehicle patrol in al-Garma town, 15 km east of Falluja, local residents said. An explosive charge detonated Friday near a police patrol vehicle in Kirkuk, 250 km northeast of Baghdad, with no reports of casualties, a security source said. A civilian killed by unidentified gunmen in Missan province, while a former member in the dissolved Baath party was injured when a group of armed men opened fire against him in central city, a source in Missan police department said on Friday. The forensic medicine department in Diala province received seven unidentified bodies on Friday that had been found in different areas near Baaquba city, 57 km northeast of Baghdad, a source from the forensic medicine department said. Iraqi police forces, backed by U.S. troops, killed two gunmen and arrested six others in Diala province, central Iraq, a police source said on Friday. Thanks to whisker for some of the links above. Iraqis in the volatile al-Anbar province west of Baghdad are reporting regular killings carried out by U.S. forces that many believe are part of a 'genocidal' strategy. Since the mysterious explosion at the Shia al-Askari shrine in Samara in February last year, more than 100 Iraqis have been killed daily on average, without any forceful action by the Iraqi government and the U.S. military to stop the killings. U.S. troops and Iraqi security forces working with them are also executing people seized during home raids and other operations, residents say. "Seventeen young men were found executed after they were arrested by U.S. troops and Fallujah police," 40-year-old Yassen of Fallujah told IPS. "My two sons have been detained by police, and I am terrified that they will have the same fate. They are only 17 and 18 years old." 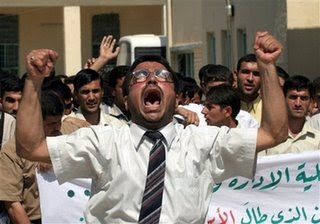 Residents of Fallujah say the local police detention centre holds hundreds of men, who have had no legal representation. Others are killed by random fire that has long become routine for U.S. and Iraqi soldiers. Sa'ad, a 25-year-old from the al-Thubbat area of western Fallujah was killed in such firing. "The poor guy kept running home every time he saw U.S. soldiers," a man from his neighbourhood, speaking on condition of anonymity, told IPS. "He used to say: Go inside or the Americans will kill you." Sa'ad is said by neighbours to have developed a mental disability. He was recently shot and killed by U.S. soldiers when they opened fire after their patrol was struck by a roadside bomb. Last week, U.S. military fire severely damaged the highest minaret in Fallujah after three soldiers were killed in an attack. What was seen as reprisal fire on the minaret has angered residents. "They hate us because we are Muslims, and no one can argue with that any more," 65- year-old Abu Fayssal who witnessed the event told IPS. "They say they are fighting al- Qeada but they are only capable of killing our sons with their genocidal campaign and destroying our mosques." Others believe occupation forces have another sinister strategy. "It is our people killing each other now as planned by the Americans," Abdul Sattar, a 45- year-old lawyer and human rights activist in Fallujah told IPS. "They recruited Saddam's security men to control the situation by well-known methods like hanging people by their legs and electrifying them in order to get information. Now they are executing them without trial." IPS has obtained photographs of an elderly man who residents say was executed last month by U.S. soldiers. "Last month was full of horrifying events," a retired police officer from Fallujah told IPS. "Three men were executed by American soldiers in the al-Bu Issa tribal area just outside Fallujah. One of them was 70 years old and known as a very good man, and the others were his relatives. They were asleep when the raid was conducted." The two men showed up on Tuesday afternoon to evict Suaada Saadoun's family. One was carrying a shiny black pistol. 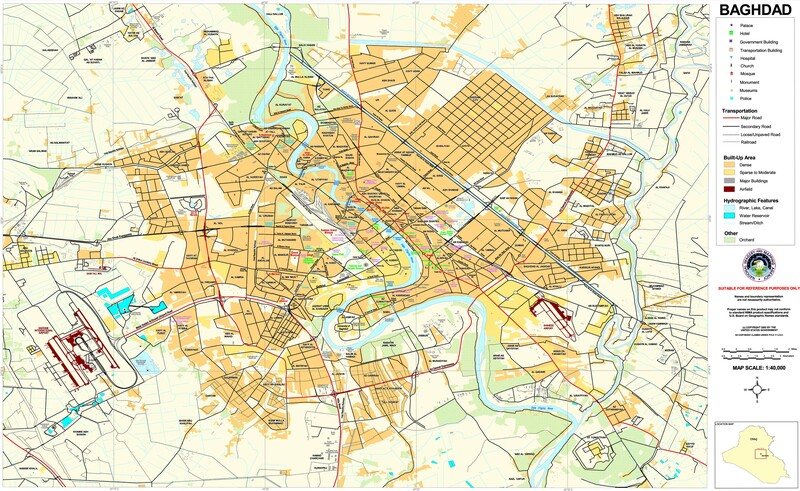 Saadoun was a Sunni Arab living in a Shiite enclave of western Baghdad. A widowed mother of seven, she and her family had been chased out once before. This time, she called American and Kurdish soldiers at a base less than a mile to the east. The men tried to drive away, but the soldiers had blocked the street. They pulled the men out of the car. "If anything happens to us, they're the ones responsible," said Saadoun, 49, a burly, boisterous woman in a black robe and lavender-blue head scarf. The Americans shoved the men into a Humvee. Neighbors clapped and cheered as if their soccer team had just won a title. The next morning, Saadoun was shot dead while walking by a bakery in the local market. ……..The final hours of Saadoun's life reveal the ferocity with which Shiite militiamen are driving Sunni Arabs from Baghdad house by house, block by block, in an effort to rid the capital of them. It is happening even as thousands of additional American troops and Iraqi soldiers have been sent to Baghdad as part of President Bush's so-called surge strategy. Muqtada al-Sadr issued a scathing attack on the United States today, after one of the country’s bloodiest days, blaming Washington for Iraq’s troubles and calling for a mass demonstration April 9 - the fourth anniversary of the fall of Baghdad. As al-Sadr’s remarks were read in a mosque, Shiites in Baghdad loaded wooden coffins into vans and shoveled broken glass and other debris into wheelbarrows in the aftermath of a double suicide bombing at a marketplace. At least 181 people were killed or found dead yesterday as Sunni insurgents apparently stepped up their campaign of bombings to derail the seven-week-old security sweep in Baghdad. "There is a race between the government and the terrorists who are trying to make people reach the level of despair," said Sami al-Askari, an aide to Prime Minister Nouri al-Maliki. "But the government is doing its best to defeat terrorists, and it definitely will not be affected by these bombings." As the Western media turns its attention to the fate of 15 Britons detained for allegedly trespassing into Iranian waters over the weekend, the status of five Iranian officials captured in a U.S. military raid on a liaison office in northern Iraq on Jan. 11 remains a mystery. Even though high-level Iraqi officials have publicly called for their release, for all practical purposes, the Iranians have disappeared into the U.S.-sanctioned "coalition detention" system that has been criticized as arbitrary and even illegal by many experts on international law. Hours before President Bush declared they would "seek out and destroy the [Iranian] networks providing advanced weaponry and training to our enemies in Iraq," U.S. forces raided what has been described as a diplomatic liaison office in the northern city of Arbil, the capital of Iraqi Kurdistan, and detained six Iranians, infuriating Kurdish officials in the process. The troops took office files and computers, ostensibly to find evidence regarding the alleged role of Iranian agents in anti-coalition attacks and sectarian violence in Iraq. One diplomat was released, but the other five men remain in U.S. custody and have not been formally charged with a crime. "They have disappeared. I don't know if they've gone into the enemy combatant system," said Gary Sick, an Iran expert at Columbia University who served in the White House under former President Jimmy Carter. "Nobody on the outside knows." This is the new successor blog to Today in Iraq. Baghdad- Unknown gunmen attacked a U.S. vehicle convoy on Thursday in southwestern Baghdad, setting a vehicle ablaze, an eyewitness said. Baghdad- Eight civilians were killed and 32 others were wounded when three booby-trapped cars went off early Thursday in different parts of Baghdad, a police source said. Baghdad- A Katyusha rocket landed, on Thursday morning, near the joint security center currently under construction in Sadr city in eastern Baghdad, an eyewitness said. Basra- British forces arrested on Thursday two suspected gunmen during a security crackdown north of Basra, 550 km south of Baghdad, the spokeswoman for the Multi-National forces in southern Iraq said. Basra- A British patrol was attacked on Thursday by light arms near the Iranian consulate in Basra, 550 south of Baghdad, the spokeswoman for the Multi-National forces in southern Iraq said. Mosul- A senior figure in the armed group al-Qaeda in Iraq was captured by Iraqi army forces in the city of Mosul, 402 km, north of Baghdad, a well-informed source in Ninewa province said on Thursday. Mosul- U.S. forces killed a man and three of his sons and arrested two others late Wednesday in eastern Mosul, 402 km north of Baghdad, a source from Ninewa police department said on Thursday. Mosul- A policeman was killed on Thursday by unidentified gunmen east of Mosul, 402 km north of Baghdad, a source from Ninewa police department said. Baghdad – A car bomb targets a Police Patrol in Hay Al-Amil, west Baghdad. The booby-trapped car was left on the side road with a dead body inside it as bait. It exploded as the policemen drew near to inspect it, killing 2 policemen and wounding 6. 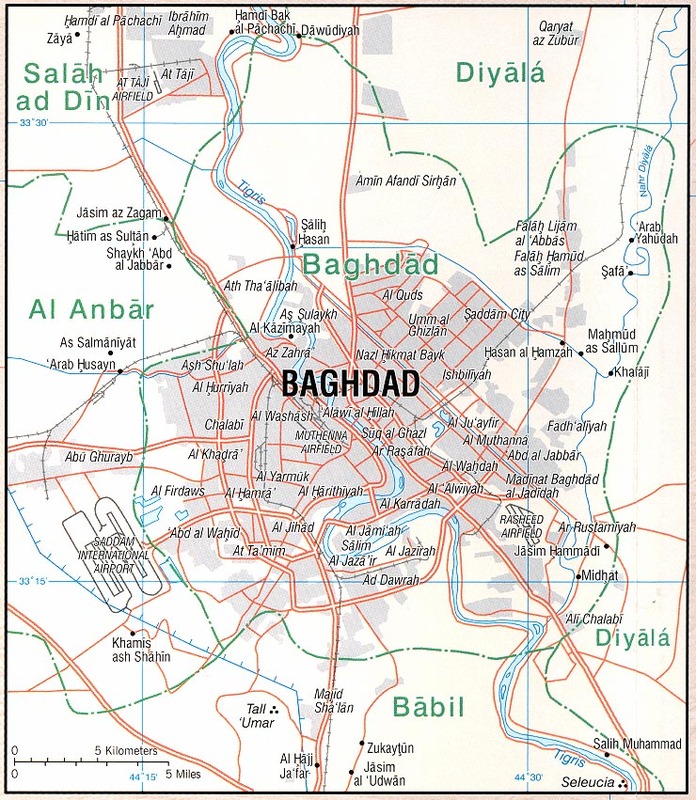 Baghdad – An IED explodes in the market place in Al-Beyaa’, west Baghdad, Road 20. It is a central market place frequented mostly by women and families. 3 civilians were killed and 20 injured, some of whom were women and children. Baghdad – Al-Jaza’ir Police Station in Al-Qanat Area , east Baghdad is targeted with mortar missiles that fall short, hitting a relatively empty area behind it wounding 4 civilians. Baghdad – A mortar shell landed in Al Zawra park causing injuries to one civilian. Baghdad – A mortar shell landed in Al Harthiya area causing injuries to one civilian. Baghdad – Gunmen abducted Dr. Ridha Al Quraishi the dean assistant of the Management and Economy College in Al Talbiya are after he left the college. Baghdad – A road side bomb exploded in Yarmouk neighborhood. No casualties reported. Baghdad – Gunmen killed optician doctor Kareem Najim Al Daini in Mahmoudiya town. Baghdad – Drive by shooting targeted residents of Al Shabab neighborhood. 1 was killed and 3 were injured. Baghdad – Suicide car bomb targeted an Iraqi army checkpoint in Al Jamiaa neighborhood. 3 soldiers were killed and 16 were injured. Baghdad – Police found 25 corpses in Baghdad. The bodies were found in the following neighborhoods: 2 corpses in Ameriya, 2 in Jamiaa, 2 in Ghazaliya, 2 in Hurriya, 1 in Mansour, 2 in Shuala, 2 in Adhamiya, 1 in Etafiya, 1 in Ealam, 7 in Doura, 1 in New Baghdad and 2 in Kadhimiya. Mahmoudiya – A mortar round landed in Mahmoudiya. 5 civilians were injured. Mahmoudiya - A car on the side of the road explodes near Al-Mahmoudiya Hospital, in a crowded market place in Mahmoudiya City, to the south of Baghdad. 4 were killed and 20 wounded, all civilians. Diyala - Around 4:00 p.m. Three car bombs exploded in Al Khalis city (20 Km north of Baqouba). The first suicide car targeted a joint Iraqi plice and army patrol in central the city, few minutes later a parked car exploded in the city’s crowded bus station and the third suicide ambulance car targeted a police patrol. Mortar shells landed in the first attack site and after the three attacks gunmen attacked different sites in the area. Two road side bombs detonated on the road leading to the hospital in the city. The attacks claimed the lives of 47 and injured 91. Tikrit - Gunmen abducted three police officers on the main road between Samara and Al Dour. Beiji - Police found a policeman’s dead body in Beiji today. The policeman was kidnapped by gunmen two days ago from the same city. BAGHDAD - A car bomb killed three people and wounded 16 in Jamiaa in western Baghdad, a police source said, adding that the bomb targeted an army patrol. BAGHDAD - A senior academic at Baghdad's Mustansiriya university named Rida Qureishi was kidnapped, a police source said. BAGHDAD - A car bomb killed four policemen and one civilian and wounded nine more police in Jihad in southwest Baghdad, the U.S. military said. Police were checking a suspicious vehicle when it exploded. MAHMUDIYA - Two mortar bombs landed in a residential district of Mahmudiya, killing two people and wounding seven, police said. MOSUL - Gunmen killed Nawaf al-Hadidi, imam of a mosque in Mosul, in a drive-by shooting on Wednesday, police said. BAGHDAD - A roadside bomb targeting an Iraqi army patrol wounded three soldiers in the western Ghazaliya district of Baghdad, a Reuters witness said. BAGHDAD - Gunmen attacked the motorcade of the head of traffic police, Jaafar al-Khafaji, in northern Baghdad, killing two traffic policemen and wounding two others, police said. BAGHDAD - A car bomb targeting an Iraqi army checkpoint killed a soldier and wounded three others on Wednesday near al-Shurta tunnel in western Baghdad, police said. DIWANIYA - Gunmen killed a policeman near his house in the southern city of Diwaniya, 180 km (110 miles) south of Baghdad, police said. DIWANIYA - The body of a young man was found shot in Diwaniya, police said. He was kidnapped on Wednesday. Five suicide bombers struck Shiite marketplaces in northeast Baghdad and a town north of the capital at nightfall Thursday, killing at least 122 people and wounding more than 150 in one of Iraq’s deadliest days in years. At least 178 people were killed or found dead Thursday, which marked the end of the seventh week of the latest U.S.-Iraqi military drive to curtail violence in Baghdad and surrounding regions. The suicide bombers hit markets in the Shiite town of Khalis and the Shaab neighborhood in Baghdad during the busiest time of the day, timing that has become a trademark of what are believed to be Sunni insurgent or al-Qaida suicide attackers. Three suicide vehicle bombs, including an explosives-packed ambulance, detonated in a market in Khalis, 50 miles north of the capital, which was especially crowded because government flour rations had just arrived for the first time in six months, local television stations reported. At least 43 people were killed and 86 wounded, police said. In the north Baghdad bombings, two suicide attackers wearing explosives vests blew themselves up in the Shalal market in the predominantly Shiite Shaab neighborhood. At least 79 people were killed and 81 wounded as they jammed the market to buy provisions on the eve of the Muslim day of rest and prayer. Shiite militants and police enraged by deadly truck bombings went on a shooting rampage against Sunnis in a northwestern Iraqi city Wednesday, killing as many as 70 men execution-style and prompting fears that sectarian violence was spreading outside the capital. 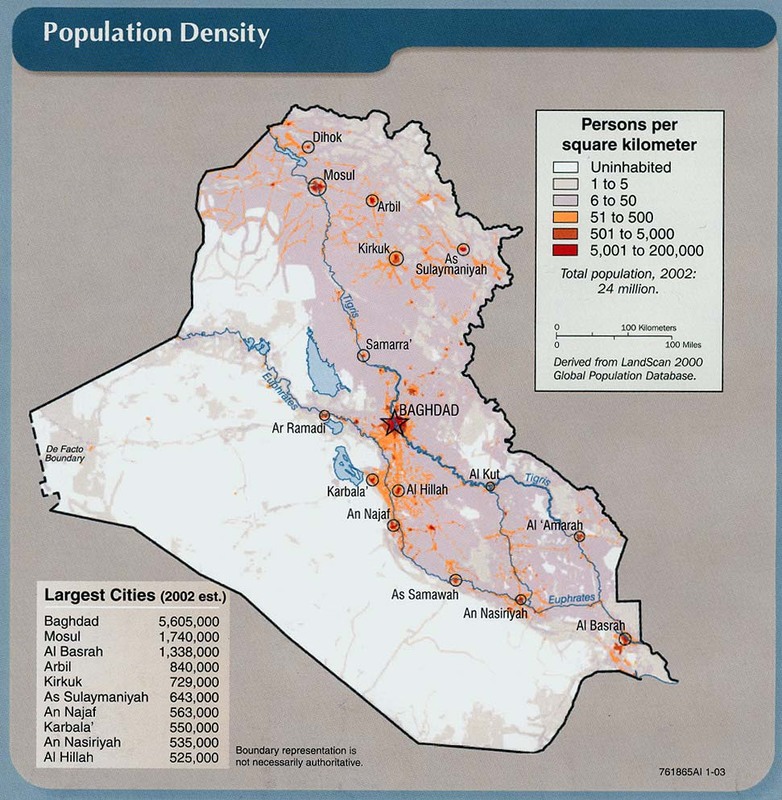 The killings occurred in the mixed Shiite-Sunni city Tal Afar, which had been an insurgent stronghold until an offensive by U.S. and Iraqi troops in September 2005, when militants fled into the countryside without a fight. Last March, President Bush cited the operation as an example that gave him "confidence in our strategy." The gunmen roamed Sunni neighborhoods in Tal Afar through the night, shooting at residents and homes, according to police and a local Sunni politician. Witnesses said relatives of the Shiite victims in the truck bombings broke into Sunni homes and killed the men inside or dragged them out and shot them in the streets. Gen. Khourshid al-Douski, the Iraqi army commander in charge of the area, said 70 were shot in the back of the head and 40 people were kidnapped. A senior hospital official in Tal Afar, who spoke on condition of anonymity out of security concerns, said 45 men were killed. Outraged Sunni groups blamed Shiite-led security forces for the killings. Prime Minister Nouri al-Maliki's office ordered an investigation and the U.S. command offered to provide assistance. Ali al-Talafari, a Sunni member of the local Turkomen Front Party, said the Iraqi army had arrested 18 policemen accused in the shooting rampage after they were identified by Sunni families. Shiite militiamen also took part, he said. Iraq's Sunni vice president urged the government on Thursday to do more to purge security forces of militias after a group of Shi'ite police shot scores of men in reprisal killings in a northern town this week. Hours after truck bombs killed 85 people on Tuesday in a Shi'ite area of Tal Afar, up to 70 Sunni Arab men were shot dead in a town which only a year ago was held up by U.S. President George W. Bush as an example of progress towards peace. The governor of Nineveh province, which includes the town of Tal Afar, said policemen who took part in the reprisal shootings were arrested but then freed again to prevent unrest. Prime Minister Nuri al-Maliki, a Shi'ite, has ordered an inquiry into the involvement of police in the killings. Vice President Tareq al-Hashemi, the most senior Sunni Arab politician, said militias acting under "official cover" in the reprisal killings should be treated as severely as insurgents. A statement from his office said car bombs against "our Shi'ite brothers" must stop and condemned "the criminal behaviour by some policemen in randomly killing many civilians". "It requires efforts from both sides to put an end to this bloodshed which aims to destroy all of Iraq. But this is not enough if the government does not move quickly to clear the security forces of militias," the statement said. ……Doctor Salih Qadu, head of Tal Afar hospital, said the final toll from the two bombs had risen to 85. He said 60 bodies of men shot in the aftermath had been brought to the hospital. A senior Iraqi army officer put the toll from those attacks at 70. What a fool believes, he sees……. Iraqi authorities have arrested 13 policemen for carrying out a massacre of 70 Sunni Arabs in a northern Iraqi town to avenge a devastating bomb attack, officials said on Thursday. On Tuesday, a suicide bomber blew up a truck in a Shiite district of Tal Afar -- a town rated in 2006 by US President Bush as a symbot of a stable Iraq – and killed 85 people and wounded 183 others. A few hours after the blast, dozens of armed men, some wearing police uniforms according to witnesss, went on a rampage in a Sunni district, dragged men out of their homes and shot them with bullets to the head. At least 70 people were killed, while 30 were wounded and 40 more remain missing in one of the worst sectarian attacks in Iraq in recent months. Just 8 years old, Noor fell victim to an all-too-common crime in Baghdad. Kidnapped from school, she was held for ransom – beaten, blindfolded, and locked in an empty room – for four days. Her father raced to come up with the money, fearing she would be yet another casualty in the city's plague of abductions. A driver by occupation, he sold the family's car to give his tormenters what they wanted: $8,000 for his daughter's life. Noor and her family fled Baghdad. But three years later she was still haunted by her memories. They joined some one million Iraqis now living in Syria among them an untold number of children struggling to cope with the emotional wounds of war. For Noor, and many other Iraqi children like her, there appeared to be no place to turn until a Syrian psychiatrist, risking his job at a state institution, defied authorities and decided to help. Dr. Naim isn't his real name. The Syrian psychiatrist says he is afraid of his Syrian state employers who refused to allow him to treat Iraqi children, even though he volunteered to do so on his own time. In the same Christian neighborhood where Noor and her family lives is a small center run by the Sisters of the Good Shepherd. "The nuns would come and visit us and other Iraqi families at home," Noor's mother, Wafaa, says. "They told us about a program for children that was going to be held at the church." It was there that Noor, a Christian, and the doctor, a Muslim, first met. Naim had worked with the Sisters before, helping a handful of troubled Syrians whom the nuns had referred to him. But soon he saw the need for another kind of program. "The nuns were seeing a lot of disturbed Iraqi children," he says, from his sparsely furnished office in central Damascus. And so, after weeks of intense research on the Internet – and much encouragement from his physician wife – he devised a group-therapy program that incorporated games, puppet shows, and artwork. Every Saturday for seven months, the tiny chapel run by the Sisters was transformed into a clinic for 28 children, ranging in age from 7 to 14. "I doubted myself at first. I was afraid that I couldn't help these kids, that I might open a wound that wouldn't heal," says Naim. "But circumstances can make you do extraordinary things." Following are key excerpts from the final declaration endorsed by Arab leaders at the end of a two-day summit in Riyadh on Thursday. The declaration endorses an Arab peace initiative launched in 2002 but makes no direct mention of key issues such as the fate of Palestinian refugees. - (The summit) "affirms a just and comprehensive peace as a strategic option for the Arab nation and the Arab peace initiative that draws the right path for reaching a peaceful settlement to the Arab-Israeli conflict based on the principles and resolutions of international legitimacy and the land for peace formula." - (The summit) "stresses the importance of freeing the region from weapons of mass destruction without double standards, warning against starting a dangerous and destructive nuclear arms race in the region and emphasising the right of all countries to peaceful nuclear power." - (The summit) "decides to spread the culture of moderation, tolerance, dialogue and openness, to reject all forms of terrorism and extremism as well as all exclusionary, racist trends, campaigns of hatred and endeavours to question our humanistic values or defame our religious beliefs and holy places, and to warn against growing sectarianism for political purposes that aims to divide our nation and ignite destructive sedition and civil strife." Iraqi Vice President Tareq al-Hashemi, in Ankara, discussed with Turkish President Amhet Necdet Sezar ways of bolstering relations between Iraq and Turkey. 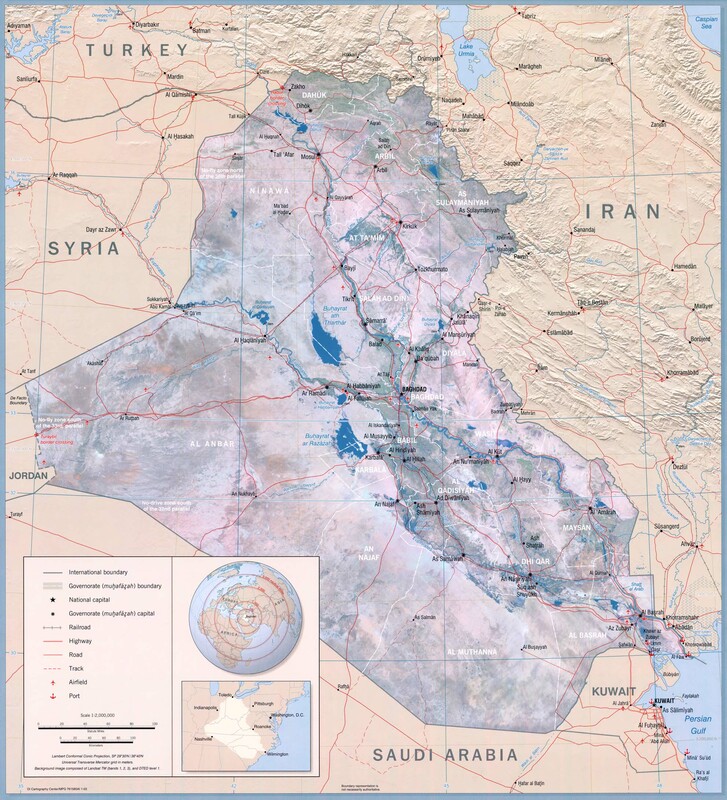 "The Iraqi government is determined not to allow its territories to be a source of concern to Iraq’s neighbors, particularly Turkey," al-Hashemi's office said in a statement received by the independent news agency Voices of Iraq (VOI). For his part the Turkish president stressed his country's keenness to lend support to the people of Iraq and to preserve its unity, the statement added. The two sides also exchanged views on the situation in Kirkuk city, a northern Iraqi city with mixed population of Arabs, Turkmans and Kurds, said the statement, noting that they agreed to act to insure that Kirkuk would remain a city where all communities live in peace altogether. The new US ambassador to Iraq, Ryan Crocker, was sworn in at the American embassy in Baghdad's tightly fortified Green Zone on Thursday. Crocker, who is one Washington's most experienced career diplomats with extensive knowledge of the Middle East, replaces Zalmay Khalilzad, who left the country earlier this week after a 21-month posting. He was sworn in by embassy official Tina Tran at a ceremony attended by US Lieutenant General David Petraeus, the head of US forces in Iraq, and by embassy officials, embassy spokesman Lou Fintor said. "We have a historic challenge ahead of us. Terrorists, insurgents and militias continue to threaten security in Baghdad and around the country. Security is without question the central issue," Crocker told the ceremony. Policymakers and strategic analysts in the Arab world have little confidence that current US troop surge in Iraq will do much more than – at best – postpone a complete political-security breakdown in Iraq, which, they fear, could then spread across the Middle East. During my lengthy recent discussions with experts in Egypt, Jordan, and Syria and well-connected Iraqis in Jordan, and well – connected Iraqis in Jordan, I heard a lot about how Iraq’s collapse has been affecting these Arab societies. The British Government has published a map showing the coordinates of the incident, well within an Iran/Iraq maritime border. The mainstream media and even the blogosphere has bought this hook, line and sinker. But there are two colossal problems.